Roger and I did a sweep through Barnes & Noble tonight, with my husband allowing me just a few minutes to check out the featured books. I saw that Rock Your Ugly Christmas Sweater was published in early October, and it looks like the 200+ photos of people and pets at their holiday ugliest will be a best-seller. 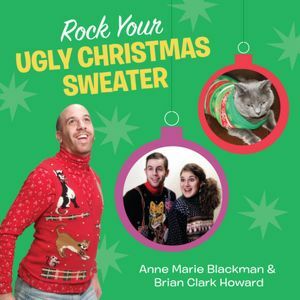 Author Anne Marie Blackman runs the website myuglychristmassweater.com. Who knew a person can make a living from this? Some of the featured sweaters have ornaments and lights in strategically placed areas, which make the possibility of wearing said sweater in the office virtually impossible. Co-author Brian Clarke Howard is a web editor for National Geographic and a specialist in ugly Christmas sweater lore, having published several articles on the subject. Thumbing through the small book, I figure it would make a great stocking stuffer and maybe a good door prize if you are planning your own ugly sweater party. 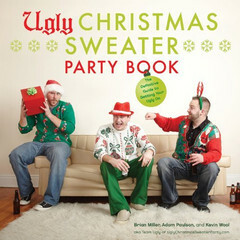 Last season’s big selling was The Ugly Christmas Sweater Party Book, by a trio of ugly sweater vendors. They, too, have their own website, uglychristmassweaterparty.com. It’s difficult to decide which of the two websites had the ugliest sweaters. The sweater party guys have been on Jay Leno and a few other talk shows, TheYuleLog’s holy grail of success. And, here’s the rub, I’m pretty sure I have worn (with pride) a number of the ugly sweaters featured on the sites. 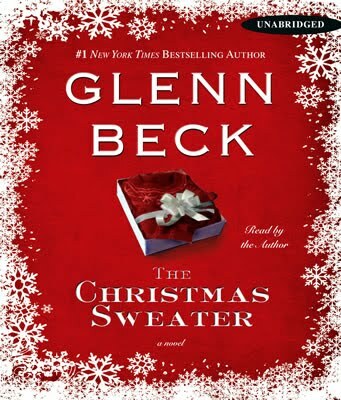 That’s not to be confused with Glenn Beck’s offering, The Christmas Sweater, a serious Christmas tale about a poor boy who rejects a sweater his mother makes for him. Reviews are not positive, but I will be looking for a copy at the library to make my own decision. While I am just a visitor in the land of ugly sweaters, I defer to my YuleLog partner, Jeremy, who is most likely a specialist in the field. We have much to talk about on next week’s podcast. This entry was posted in Books and tagged ugly sweaters. Where is your podcast from this Monday, October 15?? ?